On Sunday July 16th we played at Denby Dale as part of Yummy Yorkshire’s, “Yummy Fest.” The weather was lovely and the ice creams were very yummy indeed! Also in July we played at Beaumont Park in Huddersfield as part of the “Yorkshire Gala Day”. We were there on Sunday, 30th and played from 1.00-2.00pm and 3.00-4.00pm. Again, the weather was kind to us and we had a lovely afternoon with a very appreciative audience. August takes us to the rather stylish Middleton Park bandstand in Leeds where we will be playing from 2.30-4.30pm on Sunday 13th. Fingers crossed for another fine afternoon. On Sunday 3rd September from 2.00-4.00pm we are proud to be playing back in Shepley village for a cream tea garden party at Cliffe House. Please come along and support us and your village and of course enjoy a lovely cream tea. The sunshine has been ordered, we just hope it can be delivered on the day. Hope to see you all there. Our last outing this summer is also in Shepley. On Sunday 10th September we are playing from 11.00- 11.45am at the “Shepley Fun Run, 10k and Tractor Run”. Hope to see you all there too! 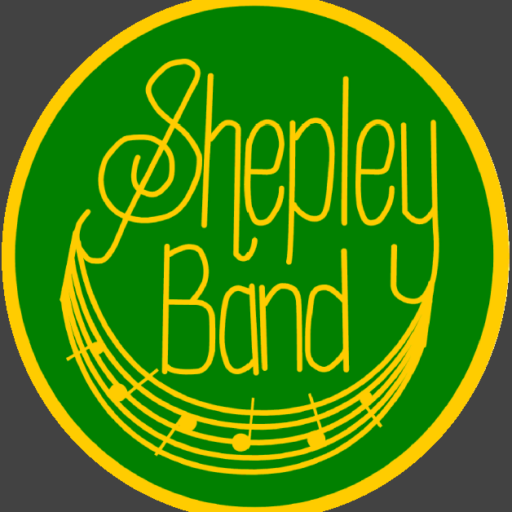 Shepley Band’s future is looking good. We have a great new Musical Director and some good ideas for future concerts, but we are still short of players in some areas of the band. If you can play a brass, percussion or woodwind instrument and have nothing to do on a Tuesday evening, why not come along to one of our rehearsals and give us a try. We are all very friendly, so please come along and don’t be shy.